A campaign is underway to make it a stat holiday. Prime Minister Justin Trudeau is marking National Aboriginal Day with a symbolic name change to the annual celebration of the First Nations, Inuit and Métis peoples of Canada. Trudeau announced in a statement Wednesday that the government intends to refer to the day as the National Indigenous Peoples Day from now on. But the prime minister did not signal if his government will support an NDP MP's private member's bill to recognize the day as a statutory holiday, as it is in the Northwest Territories and Yukon. 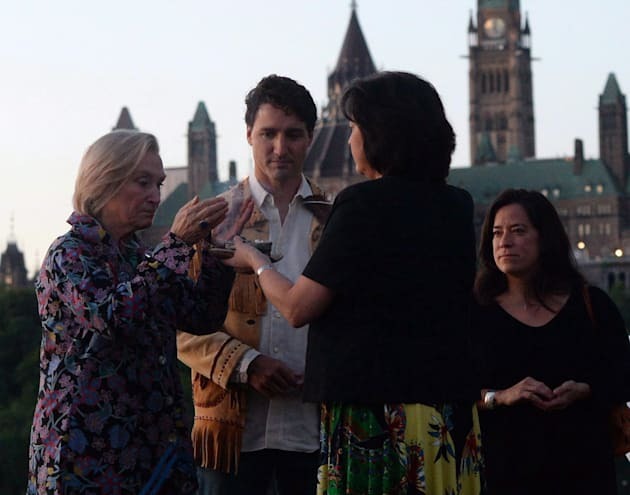 Prime Minister Justin Trudeau looks on as he is joined by Indigenous and Northern Affairs Minister Caroly Bennett, left, and Minister of Justice and Attorney General of Canada Jody Wilson-Raybould, right, as they take part in the National Aboriginal Day Sunrise Ceremony on the banks of the Ottawa River in Gatineau, Quebec on June 21, 2016. Established in 1996, National Aboriginal Day takes place every June 21 to coincide with the summer solstice. It's meant to be a day to reflect on the heritage and contributions of indigenous peoples, as well as the challenges they still face on the long road to reconciliation. Trudeau's statement noted the work that remains to build a true nation-to-nation relationship, including reviewing all federal laws pertaining to indigenous peoples and "making progress" on the 94 calls to action from the Truth and Reconciliation report into Canada's residential school system. "We are determined to make a real difference in the lives of Indigenous Peoples — by closing socio-economic gaps, supporting greater self-determination, and establishing opportunities to work together on shared priorities," he said. Trudeau also noted that Canada's 150th birthday in July will provide an opportunity to think about "the legacy of the past." The semantic shift to "indigenous" — now generally seen as the preferred term to refer to the original inhabitants of Canada — follows the Trudeau government's decision in 2015 to rename the Department of Aboriginal Affairs to Indigenous and Northern Affairs Canada. The move was applauded at the time as a respectful gesture. The term is more commonly recognized internationally, perhaps most notably in the United Nations Declaration on the Rights of Indigenous Peoples. New Democrats released a statement Wednesday from two indigenous members of their caucus — Romeo Saganash, who is Cree, and Georgina Jolibois, who is Dene. Saganash serves as his party's indigenous affairs critic while Jolibois is leading the push to for National Aboriginal Day to become a federal stat holiday. "Every day that we, as Indigenous Peoples, walk through a society built on colonial values is a day that we are reminded of how much work there is still to do to ensure a successful future for all our children," Saganash, a residential school survivor, said in the release. Jolibois told HuffPost Canada last week that her bill would support the "spirit" of a call to action from the Truth and Reconciliation Commission to create a national, statutory holiday to honour residential school survivors. Liberals have pledged to implement all 94 recommendations from the TRC report. Jolibois' bill would only apply to workers in the federal public sector and, if it passes, she says it would remain the private sector's prerogative to offer the day off to employees. But passing the bill could send a signal to the provinces to follow suit. The Northwest Territories first recognized the day as a stat in 2001, and Yukon is doing the same this year. "We can't change the past; however, we can be honest and educate ourselves so that history does not repeat itself," Jolibois said in her statement Wednesday. "Through a sense of hope, we can develop a path forward together, as our ancestors intended."